The goyaPhone is an online software that works in the browser; there's no need to download and install anything. For the equipment, just plug a headset in your computer and you're ready to go. For the internet connection, you'll need to be on a network that allows websockets, which is generally the case. The goyaPhone is an online software and you can access your account from any device. However, making calls requires technologies that only work in Chrome running on a Windows 10 PC, Mac OS or a Chromebook and importing an Excel spreasheet is only available on desktops. For email, you'll need an email client configured to work with the mailto protocol. Click here for the goyaPhone compatibility test. How does the goyaPhone connect to my email? It uses the mailto protocol. The goyaPhone only handles outgoing emails: incoming emails are the easy part of prospecting. If you're using an installed program such as Outlook or Thunderbird, you need to check that your operating system correctly connects to your email software with mailto; you can check that in the goyaPhone compatibility test. If you're accessing your email via a browser, there are plenty of browser plugins and extensions that handle mailto: there are generic plugins and proprietary plugins, for instance Mailto for Gmail if you're using Gmail. Does the goyaPhone handle incoming calls? No, it's for cold-calling warriors for whom incoming calls are the rich man's problem. In the caller id, people will see your cellphone number or your corporate number and that's the number they'll call you back at. Besides, it wouldn't make sense to handle incoming calls because of course, you're not always at your desk. In the goyaPhone, you can set the status of a lead to new, cold, warm, hot, goal or dnc (do not call). If your business uses a different semantic, you can create a custom field that you can call "qualification", or "code", and then enter the qualification of a lead as a value of that field, for instance lwfa for "left without a forwarding address." Then, on the leadsheets page, you can perform an advanced search on custom fields and quickly find all the leads marked lwfa, or any other semantic. With custom fields, the goyaPhone adapts to your lead qualification terminology. 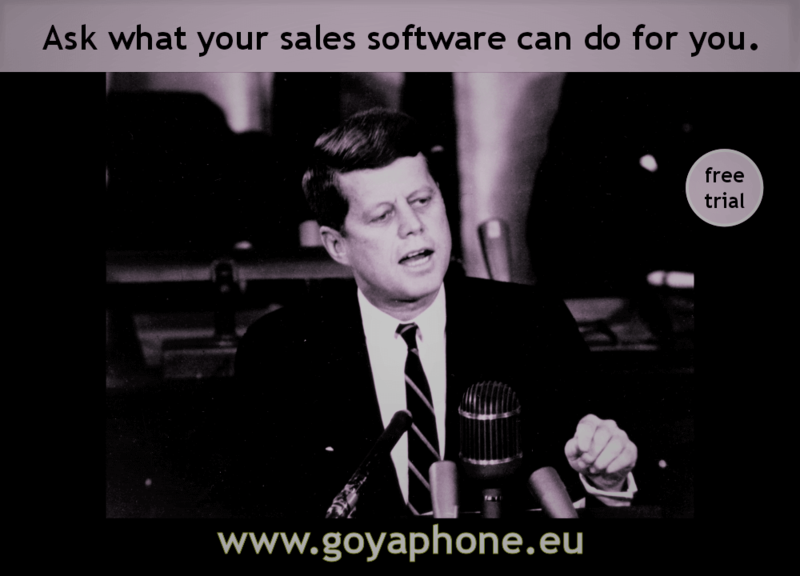 Unlike other sales software, the goyaPhone provides a visual experience that's designed to keep you going. It's not designed for the casual passer-by, it's designed for the regular end-user: a dull white-looking interface might initially look slick, but would be boring after a few hours of use. After you'll have spent a few days on the goyaPhone, you'll understand why it's designed to look like a toy rather than a boring professional business software. Part of what makes a game addictive is the scoring system: people keep on playing a game because they earn points and want to beat their highest score. With the goyaPhone, you'll see your call statistics evolve in real-time. Every call increments the counter and every second of every call you'll have the feeling you're making progress. So rather than a drag, making that extra call will feel rewarding, and you'll keep going. The sub-conscious works like magic. What makes the goyaPhone efficient to work with? The goyaPhone is like the memory for salespeople: it remembers everything you do without you having to do much. It's like a CRM with the phone and the email integrated in one beautiful user interface: one click to dial, one click to prepare the follow-up email, one click to book appointments. So for instance, when you make a call, there's no need to log your sales activity manually: the goyaPhone logs it for you, no data entry, very efficient. And because all your sales data is in the software, the follow-up becomes very easy: "show me all the people I haven't spoken to in the last 3 months but with whom I spoke more than 5 minutes and who were even willing to receive an email." With the goyaPhone, you can find them in just a few clicks. That way, the work you did back then still counts because the goyaPhone helps you remember the leads you might have otherwise forgotten about. And that's why it's so efficient. How do I import and export my data with the goyaPhone? The goyaPhone works with Excel spreadsheets. To import, all you need is an Excel spreadsheet. No need to worry about the order of the columns: drag-and-drop makes it easy. You can also export your data in Excel format: in addition to leads, you can also export your call statistics and your call history. Yes, we will never resell your data: our business model depends on our confidentiality and we are fully GDPR compliant. Is there a way to record phone calls? Is the goyaPhone good value? By definition, value is the difference between benefits and cost, and part of the art of business is discerning value. Some spend thousands per month on salespeople, but cringe at spending a relatively marginal amount on a sales software: their salespeople work with subpar tools. Some purchase a sales software, but think of software as a commodity where the only difference is the price: their salespeople work with subpar software because someone saw value in saving 20€ a month. Some even hire one or two software developers to build an internal sales tool at a cost of 100-200K per year just to save 80€ a month on software, and their salespeople wonder why. So, is a telephone sales software good value? Is the goyaPhone good value? Is it better than what you have? Will it make your job easier? The best way to tell is to simply try it out and see how it impacts your prospecting and your bottom line. If you're working independantly, grab an Excel spreadsheet and in minutes you'll be on the phone. If you're managing a sales team, give it to both your strongest and your weakest performer and see for yourself. The value proposition of the goyaPhone is simple: remove the pain out of prospecting so that you get more prospects, more appointments, more closing opportunities and, ultimately, more sales.